This poster outlines the major phases of the exploration of Mars. While reading The Martian, our ACS ChemClub book study selection, it amazes me how real the story seems, even though we know humans have yet to travel to the Red Planet. But after reading the book you may have wondered how likely it is for a real mission to take place, rather that the fictional Ares Program in The Martian. 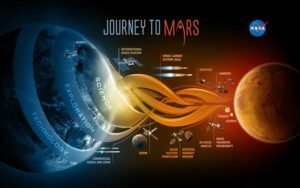 It turns out NASA is already developing the capabilities needed to send humans Mars in the 2030’s, a goal outlined in the bipartisan NASA Authorization Act of 2010 and in the U.S. National Space Policy, also issued in 2010. And it is not just NASA doing the planning, they are also working with commercial and international partners to create the Global Exploration Roadmap, which lays out a shared vision for coordinated human and robotic exploration of our solar system. In March 2017, the president of the U.S. signed a new law authorizing a manned NASA mission to Mars. 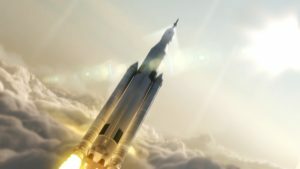 The plans for exploring are complex and have many steps, but two big pieces of technology include NASA’s powerful Space Launch System rocket and Orion, a new generation spacecraft designed to carry astronauts into deep space. The Orion Spacecraft will carry a crew of four. It is capable of missions as near as orbits around the earth to as far as Mars and beyond. Orion will have multiple uses, from transporting crew and supplies to the International Space Station to exploring deep space. NASA’s current goal is to have Orion operational by 2021. Space Launch System will be the most powerful rocket ever. The Space Launch System is classified as a super-heavy launch lift vehicle. It initially will be able to carry 70 metric tons of payload into Earth orbit. Upgrades in years to follow will double this capacity. The first version is scheduled to launch in 2018. 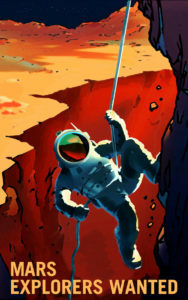 This NASA poster is one of several promoting a future mission to Mars. The next step in going to Mars is to build the Deep Space Gateway and the Deep Space Transport. The Deep Space gateway will be like a small version of the International Space Station but will orbit around the moon. This will serve as an assembly station and rest stop for astronauts headed for Mars. It will have several docking ports and room to amass supplies and equipment. The Deep Space Transport is a reusable spacecraft that will be stationed at the Gateway and will depart from there. After traveling to Mars it will return to the gateway for service and refitting and another mission. 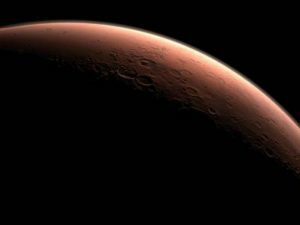 Other than landing humans on the surface of Mars and returning them safely, other details of the first mission to Mars are still in development. And if you still think this sounds like science-fiction, consider that NASA has designed a series of posters to recruit the next generation of deep space voyagers! Although they are not quite ready to accept applications, they are definitely getting the word out that the future is real. If you have any comments or questions about plans to travel to Mars, share your thoughts with us in the comment section and on Facebook or Twitter using #ACSChemClubBook. Those of you reading The Martian, our ACS ChemClub book selection, are aware of the special timekeeping system that is used for Mars. Instead of keeping track of time by days, it is measured in sols. 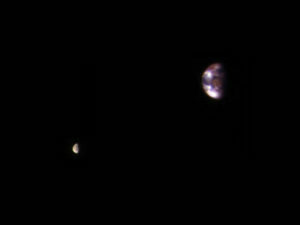 The main reason for this difference is the way Mars travels through space. Similar to Earth, Mars moves in an orbit around the sun while at the same time spinning around its own axis. There are a couple of big differences though. For one, it takes Mars about 687 days to make one trip around the sun, which constitutes one Martian year. This is compared to a year on Earth that takes approximately 365 days. The other big difference is how long it takes Mars to spin on its axis, which fictional astronaut Mark Watney points out in the book (p. 18) takes 39 minutes longer than an Earth day. This makes the Martian sol 2.7 percent longer. This might not sound like much difference, but consider that after just two weeks the change would be over 30%, or 7 hours time difference. To avoid confusion, a day on Mars is called a sol, short for a solar day. You might wonder why this is necessary, and before our modern era of space exploration it didn’t matter as much. But as scientists built and sent remote spacecraft to orbit and land on Mars, it became very important. Spacecraft, especially those that landed on the surface, were dependent on sunlight to operate their solar cells and provide electricity. Also, it was important to know when it was light enough to take pictures or videos outside, along with many other tasks. It is also much colder during the Martian nighttime compared to the hours when the sun is up. 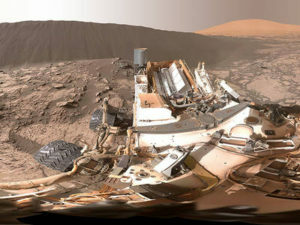 If the scientists on Earth worked on local time, it wouldn’t correspond to time on Mars. Some NASA scientists work and live on Martian time, an experience they found to be very disorienting and stressful. After just 18 days their noon comes at midnight, and soon they are having to sleep all day to get ready for their work sol. Perhaps it was easier for Mark Watney to adjust, considering all his clues for waking and sleeping were normal every sol. At any rate, worrying about how long his sol lasted was among the least of his concerns! If you have any comments or questions about keeping time on Mars share your thoughts with us in the comment section and on Facebook or Twitter using #ACSChemClubBook.